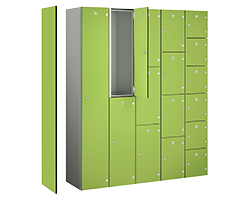 We have a wide range of Coin Operated Lockers to suit almost any requirement. Below are a selection of our most popular coin return and coin retain lockers, these lockers are particularly popular in public spaces such as gyms, leisure centres, swimming baths. If you require something more specific that you don't see on the website, just give one of our team a call on 01772 322634 or complete our quick contact form and we'll give you a call. The legal tender status of the round £1 coin will be withdrawn on 15th October 2017. From this date the new £1 Coin will no longer be in circulation, this means that if your lockers still have the old locks on they will not be able to accept the new £1 coin due to the coins shape, size, and weight will be different.